Whenever someone mysteriously dies in the drama Children of Nobody, the police find fragments of a poem, poetry that is lovely, but at the same time sinister, hinting at dark and unspeakable acts under the moonlight. The poetry is a good metaphor for the life of Cha Woo Kyun, the drama’s main character. Her life seems serene, enviable, but secrets threaten to undermine all she treasures. Cha, played by Kim Sun Ah, is happily married and has a satisfying job as a children’s counselor when suddenly visions of a girl in a green dress begin to disturb her sense of reality. The visions first appear when Cha’s workplace is associated with suspicious deaths and the poems, by a poet Cha admires, are found at the scenes of the crimes. She must chase the visions, despite the harm it does to her marriage and career. The girl has something to say and Cha must follow her until the end. 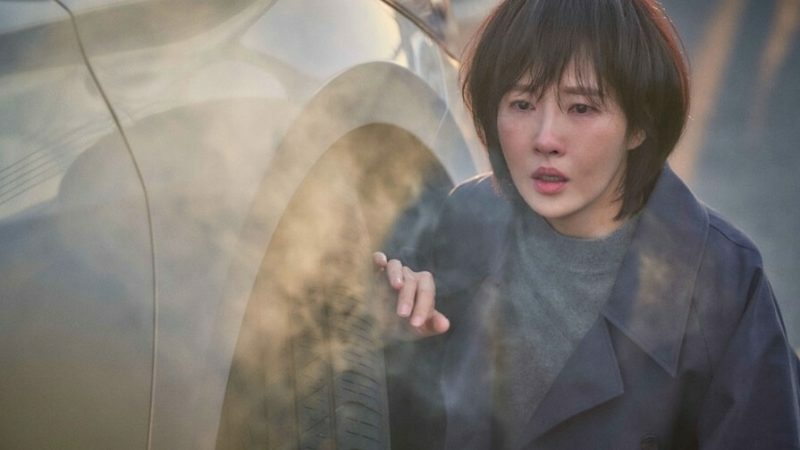 Kim Sun Ah, better known for comedic roles such as I Do I Do and My Lovely Sam Soon, imbues the restrained Cha Woo Kyun with a quiet containment that makes her later terror seem all the more frightening. Because the deaths are connected to the center where Cha works she meets police detective Kang Ji Hyun, played by Lee Yi Kyung. Lee had his first leading role in lighter fare, Welcome to Waikiki and will return in a sequel Welcome to Waikiki 2, but Children of Nobody provided him with his first serious leading role. He does an impressive job as the moral counterweight of the plotline, portraying Kang with suitable gravity and dedication. The Children of Nobody offers a vision into unimaginable cruelty and even though Kang is not easily shaken by cruelty, he does at one point wonder how there can be so many hurtful people in the world. As the mystery entangles more characters it also explores the nature of good and evil. Is a person responsible for abuse if they were once a victim? Is the person who stops cruelty and abuse a villain or a savior? Whoever is doing the killing in this story does not target innocent people, but rather works to save children. What keeps the drama a mystery to the end are the many suspects with legitimate reasons to take revenge. That list includes one of the center’s workers Lee Eun Ho, played by Cha Hak Yeon, better known as the VIXX member N. The singer began acting in 2014 in the drama Hotel King and he does a great job of making the enigmatic Lee Eun Ho seem sweetly sympathetic. Nam Gyu Ri, also formerly a singer, plays a new police detective, whose detached manner of relating makes her seem suspicious. A former member and leader of the trio SeeYa, Nam previously appeared in the film Death Bell and the drama 49 Days. The riveting mystery offers moving portraits of understandable bitterness and questionable forgiveness, although it may leave viewers wondering as Lee’s detective did, why there are so many hurtful people in the world. The tentative friendship between the mystery’s two caring souls, Cha Woo Kyun and Kang Ji Hyun makes it more than worth watching. Previous PostCan Park Bo Gum Free Song Hye Kyo From Her Icy Tower In Encounter?